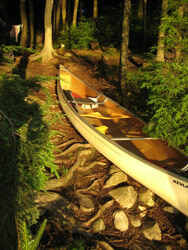 Nicole and I spent the past weekend doing some backcountry canoe camping in Algonquin. Despite the massive rainstorm we had on the first day, it was still a nice break from the city. We went up on Thursday night and car-camped at Tea Lake so we could get a good start on Friday morning... not to mention avoiding traffic. The next day, we started at Canoe lake and went north to Tom Thomson lake where we stayed the first night. It rained all day but finally cleared up in the evening and we were able to get a nice fire going and dry out. The second day was nice and sunny, and we moved to Burnt Island Lake - a relatively short trip (except for the ~1.5km portage). The next day we returned to Canoe Lake, crossing 3 portages along the way. One of my favorite things about camping is how magical running water seems when you return. You'll never appreciate a hot shower and your own bed more!